The infamous power metal sextet, DragonForce are back with their fourth studio album Ultra Beatdown. Released in Japan on August 20, 2008 and on August 26, 2008 globally. 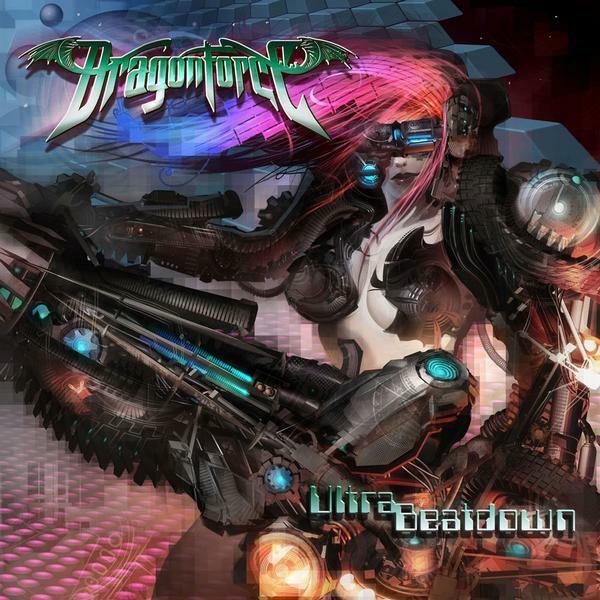 First off, I want to say, Ultra Beatdown sounds an awfully like the three DragonForce albums before it. Hear me out, though. Regardless, there’s still a lot to say about this album. While managing to keep their signature sound, the guys have found their way back to the glory days of their first album [Valley of the Damned]; one that was not an obvious attempt to showcase their musical prowess (well, not AS obvious – it’s still pretty obvious). I will say this, though. They actually seem to care more about the music as a whole than they do about the train of though ‘Man, that solo wasn’t awesome enough, let’s scrap this track’ or something similar. For Inhuman Rampage a lot of things sounded forced, and as though they traded some of the musicality of the album for faster, bigger, and more extreme solos (something I do not agree with). Whether or not this is true is unknown to me, but I am glad that that sound does not come through on Ultra Beatdown. Also, I am glad they chose the title they did for this album. Most people scoff at it, but that’s fine. That’s what it’s about. DragonForce really is just a parody of power metal bands from back in the day – they sing of epic conquests, wail unconditionally, and have more blistering guitar work than you can shake a stick it. Not to mention the outrageous tempos that they always play at. If you disagree with the fact that they don’t take themselves seriously, just go see them live. It’s a great show, and you can tell that it’s all a big joke for them (a routine they’re quite good at by now). I’m not saying this to subtract from their legitimacy, but only to point out their motives. That is the reason I can enjoy DragonForce. All in all, I really didn’t hear anything too special about the album, and it’s “typical DragonForce” – big, fast, ludicrous. There really is nothing to say about this album that hasn’t already been said about DragonForce already. That being said, it is overall the best album they have released yet. I wanted to go on some sort of epic conquest upon the end of my first listen through, much in the way you would after listening to a Rhapsody (now Rhapsody of Fire) album.